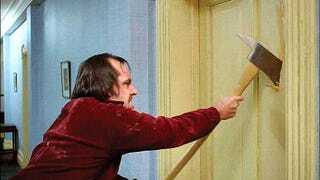 I've had my share of frustrating episodes with Internet Service Providers, but never to the point of hacking into their servers three times in one day, deleting data, walking into their office wielding an axe and threatening the owner with it. That's what Bryce Kingsley Quilley did. three counts of unlawful modification of computer data, one aggravated count of threatening to cause harm and one aggravated count of threatening to damage property. Oh yes, that too: after threatening the owner he also told him he was going to burn the whole building down. Clearly, this wins over the man who destroyed that T-Mobile shop in Britain.